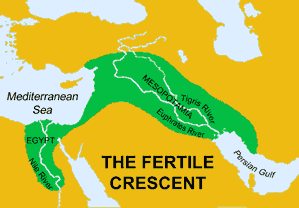 Mesopotamia is a district that has grew up along the Tigris–Euphrates rivers around 3000-1500 BC. Even though the flooding was irregular, because of these two rivers Mesopotamia was a place of abundance. That is the reason why Sumearian people settled down in that region and live throughout the years. They had a great infrastructure system to organize those floodings such as fortifications, canals, dikes and etc. The council of elders and priests were governing the city states in Mesopotamia. The architecture came into prominence in that era. Their architects constructed huge buildings. Because they needed space to collect their grains and stuff. So that, they started to construct massive towers made out of mud-bricks. Moreover, the architectural traditions developed with a written language as well to satisfy the common needs of people such as religious and politicial needs. As cities started to grow, they needed architects’ expertness even in the standard housings. Because there were regulated codes of city plannings such as alligning the streets, water disposal, infrastructure and roofing. As you can understand from the aerial viewpoint, the city is resembled as a cells through a microscope. It is because of the great planning of the canals, streets and dwellings. The citizens of the Mesopotamia thought that their city was a sacred place. So that, they gave their God’s name to the city. Because they thought it would bring protection of God of their city. The other significant structure that Mesopotamian people constructed is temples called Ziggurats. They accuulatd huge mud bricks into stepped towers. The reson of that was trying to create a stairway to heaven to have a connection with their gods. The ziggurats were showned as a concrete verticuar axis mundi, a sacred center of the world, where the privileged class and the priests and the governors performed their rituals. These rituals were performed because they believed that it would secure the destiny of the city. As a result of the division of labor for complex tasks, the high class such as priests and governors invented the first written language to keep records and inventories. They produced tablets made out of clay (mud bricks) which is most available medium for both architecture and writing. As the governors completed cuneiform writing, the city itself became a type of a language. It is the first architectural representation. The high class of the Sumerian people created architecturally parts of the city to collect and store agricultural prdoucts which are the one of the most important thing for them. So that, their architects designed a special place that known as the sacred place, using orthogonally aligned storehouses to frame temples. That place called as temenos later on in Greek.